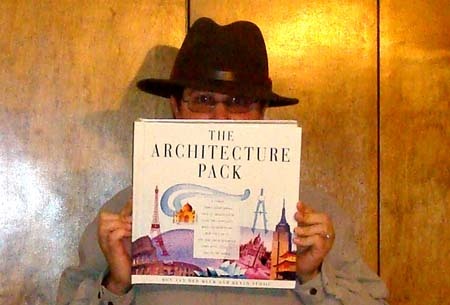 An Uncommon Architectural Pop-up Book: "The Architecture Pack"
So I'm wandering through the architecture section of the local Half-Price Books looking for anything cheap and interesting, and I come across the coolest thing: an out-of-print, architectural pop-up book! 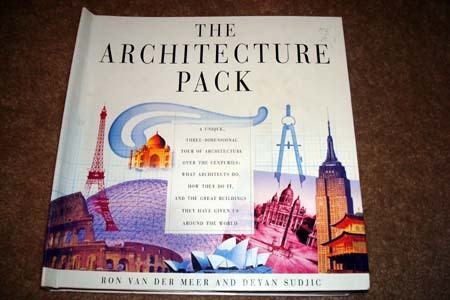 The Architecture Pack : A Unique, Three-Dimensional Tour of Architecture over the Centuries : What Architects Do, How They Do It by Ron Van Der Meer and Deyan Sudjic is a delightful mixture of fact and fun. It mixes pop-ups of famous buildings with flip and folds, overlays, action pull-tabs, guide-strings, 3D glasses to see hidden redlines and bluelines, and even includes a kit to put together a house, an audio cassette tape, and a pocket architecture glossary. Though published in 1997, the entire kit seems to have been the inspiration for the later produced Ologies books, such as Pirateology. Each page even has upside-down text that encourages the reader to turn the book around and see With visions of my son flipping the pages in the future, and playing with the interactive parts of the book to learn what daddy does for a living (someday), I gleefully snatched up the book and ran to the counter. When I finally got home to examine it in-depth, I knew I had to snap photos of it and post it on my blog. I'm going to have to buy a second one, I think. One for me, one for the boy. I have to buy it! This one is awesome-- a good find! there's another one out there that covers Frank Gehry's work by Jinny Johnson that I've been eyeing. Wow!! indeed amazing book as Vishal Charles said!!! i better use my credit card and get one!! Ps. i have on my coffee table the "101 things i learned in Architecture school" , too.. very good book! I love it. It's just outstanding. I wish I had a better photo studio set up so I could get have taken better pictures. Nice to meet you, by the way. Your photos are great! I was flipping through them the other day.